Over the course of a relationship, it is natural for either one or both of the parties involved to change to some degree. Believers by Ken Jaworowski examines the changes and obstacles that affect the lives of a pair of young lovers, and how the two deal with hardships and their ever-changing beliefs as adulthood sets in. Donna and Chris, the couple under the microscope in this play, are portrayed by two sets of actors: the first pair represents the lovers while they are still in college (where they first meet), and a second set of actors play the couple twenty years later—married and expecting their first child. The way these two stories intersect is through rotation, as alternating scenes flip between the two timelines until both stories come together at the climax. 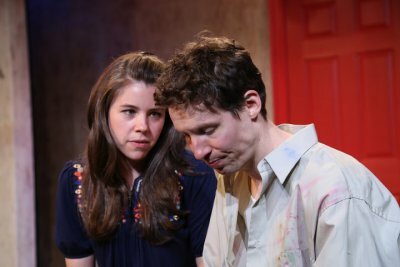 As the younger versions of Donna and Chris, Allison Linker and Ben Sumrall, respectively, portray two wide-eyed lovers who are filled with hopes and dreams, leading lives much simpler than those of their older counterparts. Linker’s Donna believes deeply in her faith, but Sumrall’s Chris is more practical and this major difference is the big conflict for this side of the play. Though the two actors’ performances are admirable, both actors are asked to play down to the young and tender age of 19, and unfortunately both barely pass as undergraduates. The set design by Craig Napoliello is minimal, as two large benches on stage represent about five different pieces of furniture each. A central focal point of the story is a canvas painting which remains tucked in a downstage corner of the proscenium, but is curiously never revealed to the audience. For such a meaningful object in the story, the decision to conceal the painting from beginning to end harms the reality of the play simply because this made it clear that the actors were probably looking at nothing more than a blank canvas. Directed by Alex Dmitriev, Believers’ pace and storytelling is inconsistent, and the thematic “vision” for the production is cloudy and misguided. 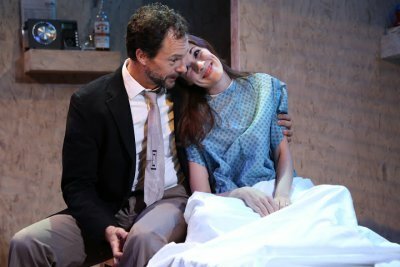 Though there is a tragic and moving story tucked into Ken Jaworowski’s new play, this production fails to translate properly from page to stage. Harold Pinter’s enigmatic classic is wonderfully enhanced by a foreign cast with their delightful accents in this striking small-scale production. Six short well-performed, mostly comic plays all with the theme of food make up this entertaining program with some that are very moving.